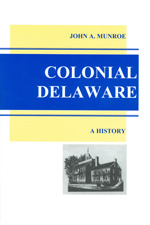 This book traces the 65-year history of African American education in Delaware. From the church house to the one-room schoolhouse to Booker T Washington and Howard High Schools, the experiments in "colored education" are detailed. The book includes numerous photographs of African American schools in all three counties. 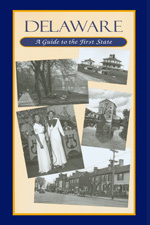 Delaware: A Guide to the First State, by the Federal Writers Project of 1938. Reprinted 2006, 549 pp., with pull out map, HARDCOVER. Prices reflect the cost of the book PLUS S&H fee of $5.00. 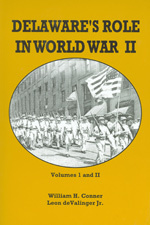 Delaware's Role in World War II, by W. Conner and L. de Valinger Jr., 2003, 600+ pp., PAPERBACK. Prices reflect the cost of the book PLUS S&H fee of $5.00. Notify me of updates to African American Education in Delaware: A History Through Photographs, 1865-1930, by Bradley Skelcher, Second edition 2007, 99 pp., HARDCOVER. Prices reflect the cost of the book PLUS S&H fees of $5.